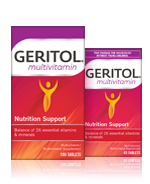 Geritol® has been making nutritional supplements for generations, health “secrets” that moms pass down to daughters, and daughters share with husbands. We make multivitamins for every body. We believe you should love the body that you’re in – and that includes taking care of it every single day! When shopping for a well-balanced multivitamin, ask yourself: Why am I taking a multivitamin in the first place? It’s important to remind ourselves why we’re doing this. It’s not a replacement for good eating. (There is no replacement for a healthy meal, so if someone is claiming to be all that, be very skeptical.) It’s to support your health, and your health is your most valuable asset in your future. The Geritol® multivitamin formula has withstood the test of time and continues to be a preferred multivitamin because we don’t practice mega-dosing or overloading; we believe in balance, providing your body with just the right amounts of nutrients by filling in gaps in your daily diet. That’s why we try to stick as close to the RDAs (Recommended Daily Allowances) as possible with the Geritol multivitamin formula. Does it feel like your body needs a boost? 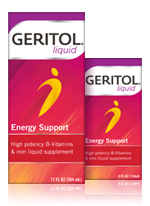 Geritol® liquid is a trusted high potency liquid supplement with iron that provides energy support when your energy levels are low. This liquid formula is designed especially to replenish daily the essential vitamins and minerals that help with energy production in the body: the B-vitamins and iron. Not too little, not too much. Just Right! Check our labels. 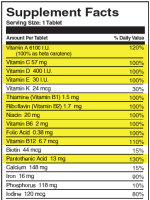 Compare to other multivitamins. In Geritol multivitamin, we’re proud to provide all 26 essential vitamins and minerals, 12 of which are at or close to 100% of the RDA. That’s what makes it a well-balanced multivitamin. 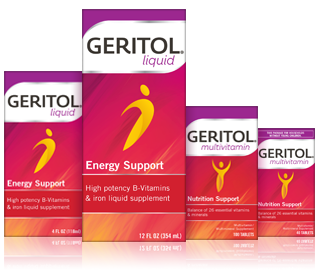 And Geritol liquid provides iron at 100% of the RDA with a healthy helping of B-vitamins for energy support throughout your day.